Today I’m back with another of my most treasured children’s books to recommend: The Imaginary Garden by Andrew Larson. In this story, Theo and her Poppa share many special days in Poppa’s garden. When Poppa downsizes to an apartment with a windy balcony, recreating that garden becomes a creative inspiration! 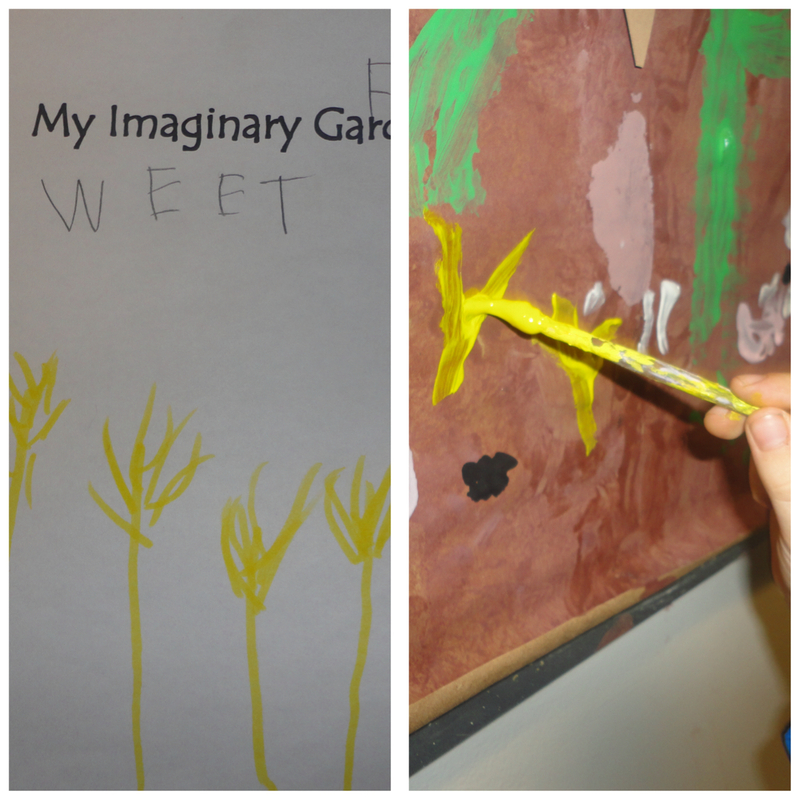 Instead of plants in pots, Theo and Poppa set about painting an imaginary garden on a large canvas. My students really responded to this book. We have been anxious for signs of spring, but since it has been a rather slow start to the growing season this book is just what we needed to tide us over until the warm days arrive. 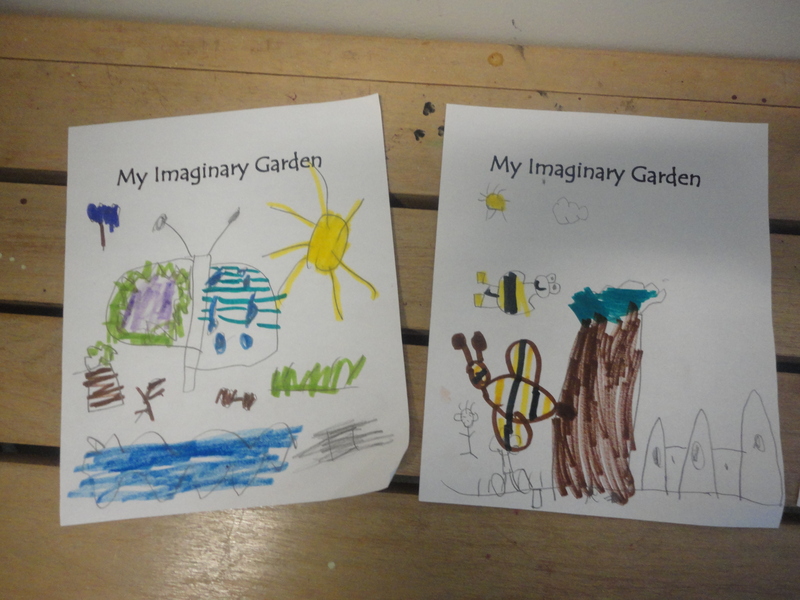 After reading the story aloud, the children were immediately interested in creating an imaginary garden of our own. We did a group brainstorming session and decided we wanted to begin where Theo and her Poppa began: by setting the stage for the garden by creating the soil, a garden wall, and the sky. 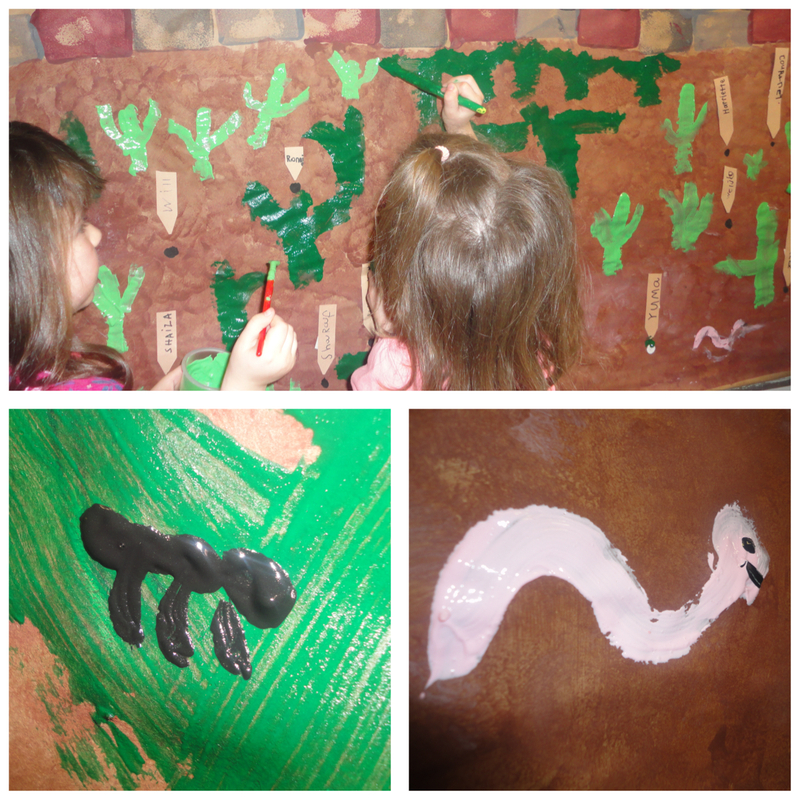 A group of students work on painting the soil. The children work on painting the sky. 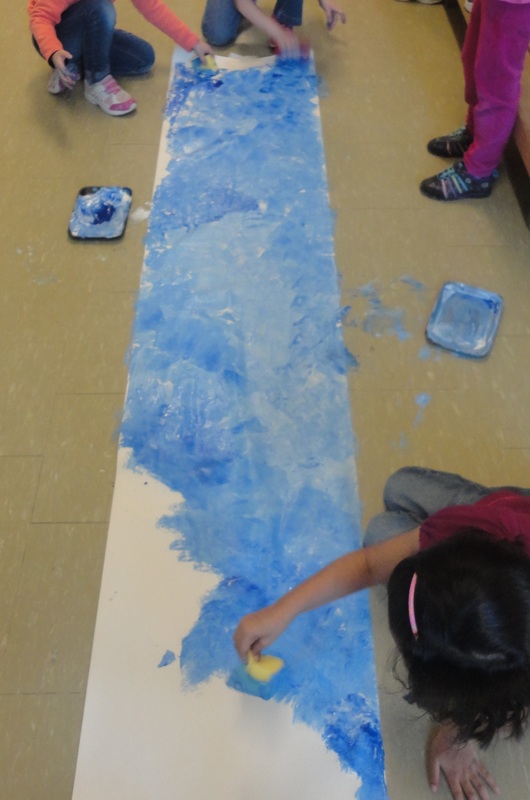 They really enjoyed mixing the paint to make different shades of blue. 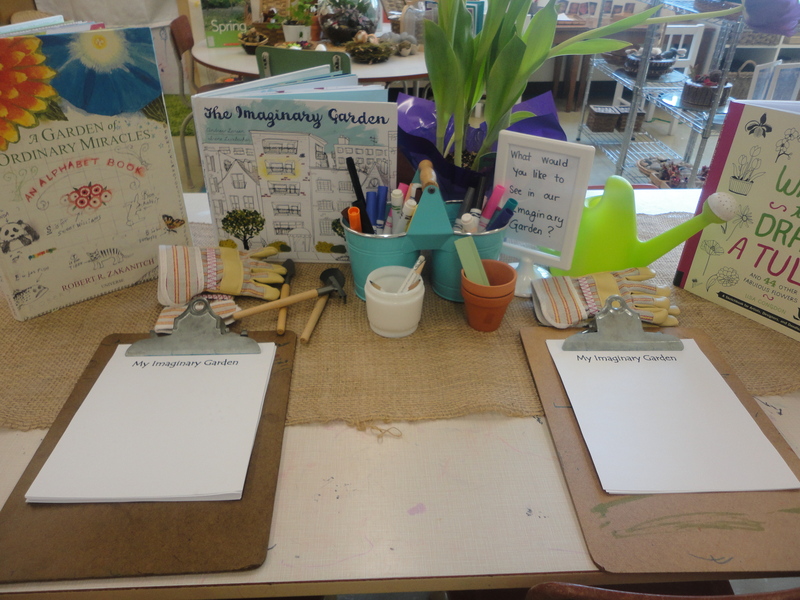 Last week we continued our garden planning by setting up a planning station at the classroom writing centre. 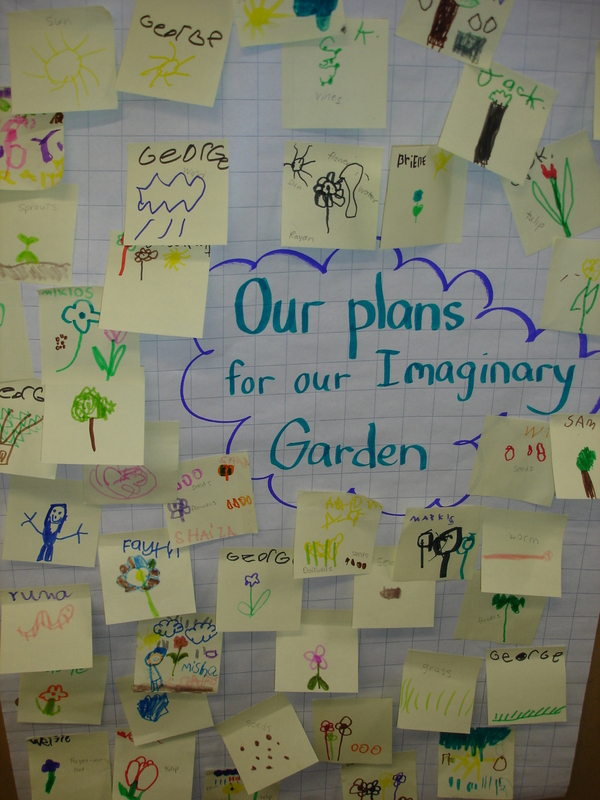 Along with a copy of the book, clipboards, planning sheets, and markers, we also included whimsical objects such as small gardening tools, pots, gloves, and real plants to get the children inspired. We also put out some books about different kinds of flowers. As the children completed their plans, we clipped them to the hanging display at our science centre. 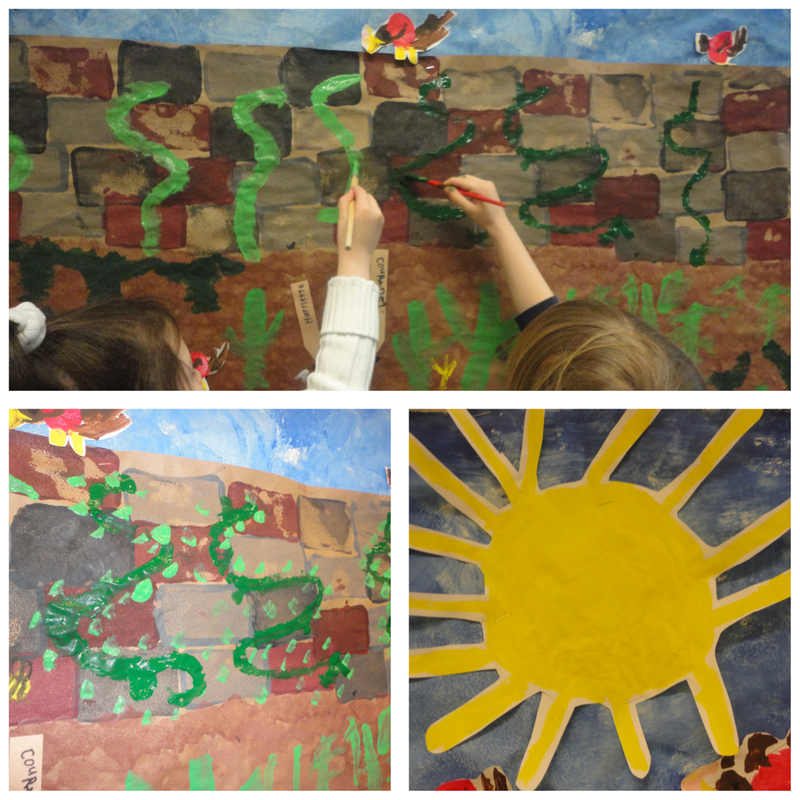 Throughout the week, children were invited into the hall to add their ideas to the mural. J.K.: Mine is going to grow into a Lego flower! Y.T. : My seed is going to be a sunflower – a GIANT one! This is how our garden looked on Friday before we headed home. I can’t wait to see what will appear this week! 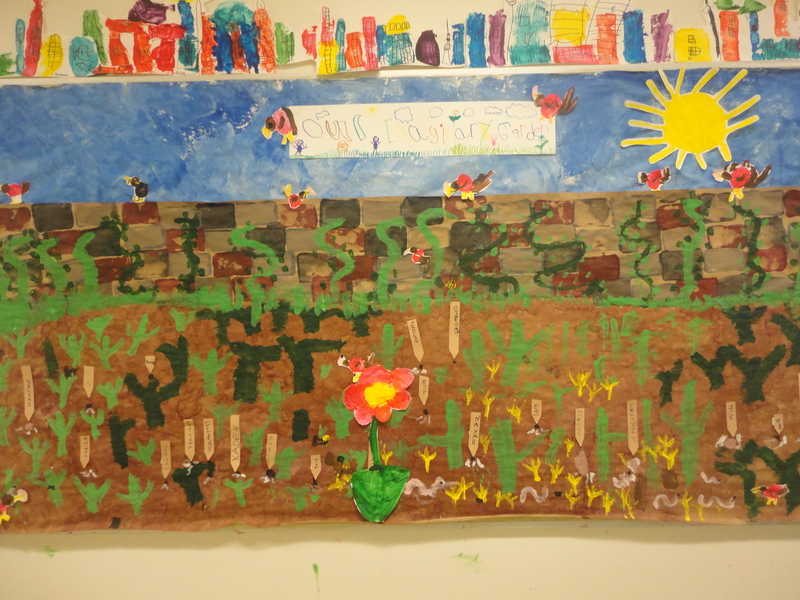 The children have already established that next week our Art Studio will be dedicated to “painting flowers for the garden.” I’ll be sure to post an update soon so you can see how our garden has grown! 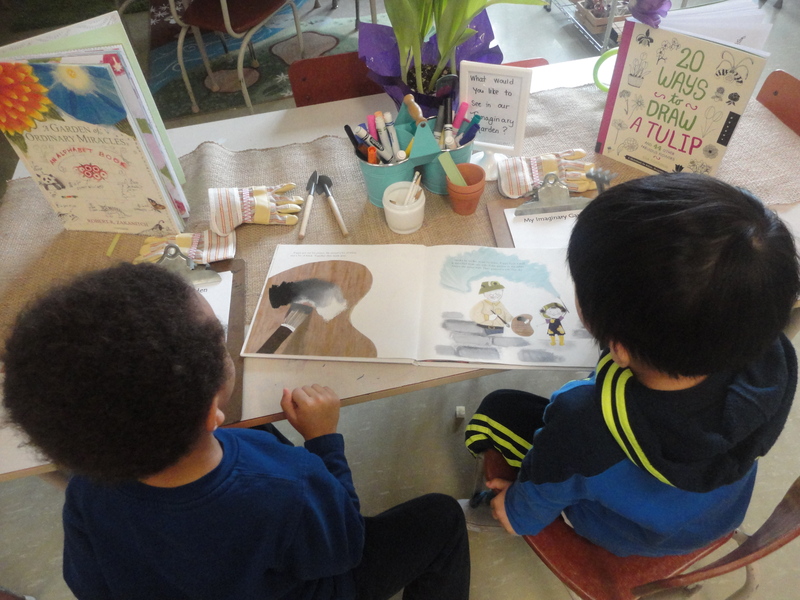 The spring bulbs popping up in the courtyard outside became a source of artistic inspiration for our students. Along with photos of our flowers outside, we also added pictures of spring flowers and some real potted plants I brought in from home to the Art Studio. 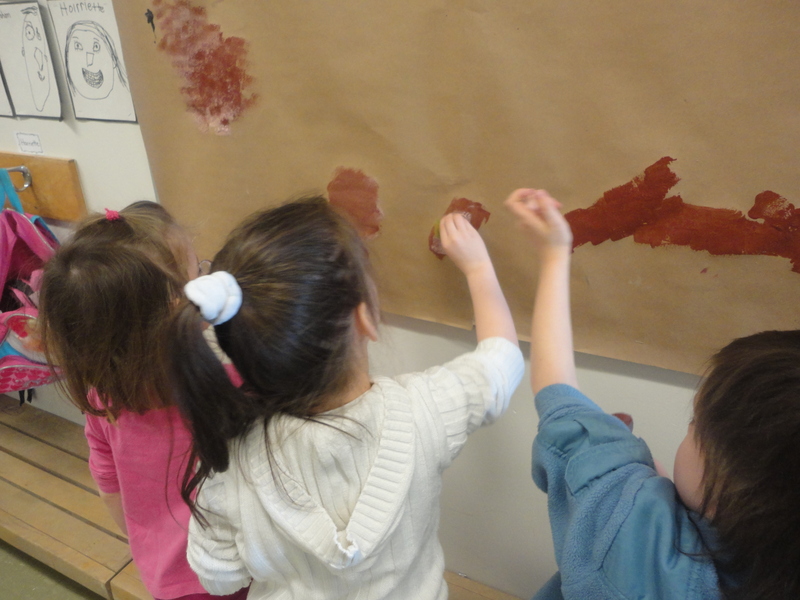 The children had access to any colour of paint they wanted (and many decided to mix their own colours!). 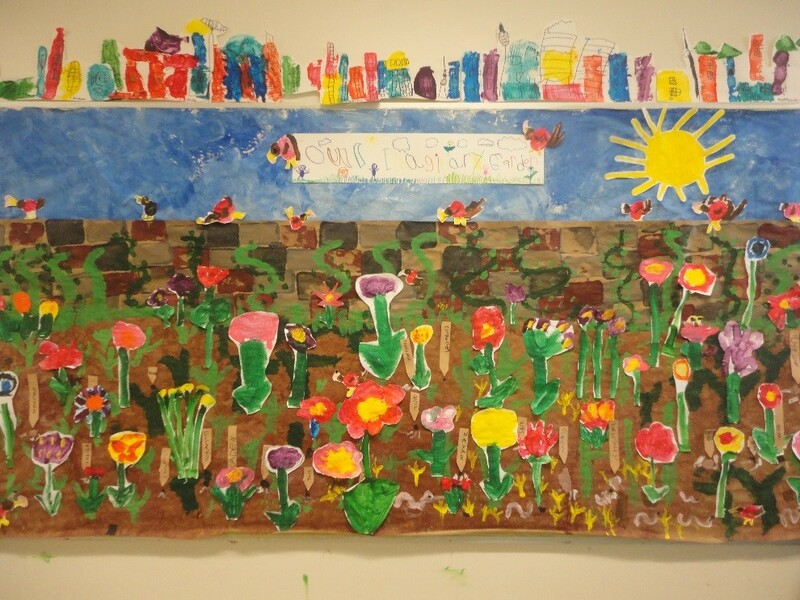 Many children visited this centre daily and waited anxiously for their painted flowers to dry so they could cut them out and “plant” them in our garden mural. 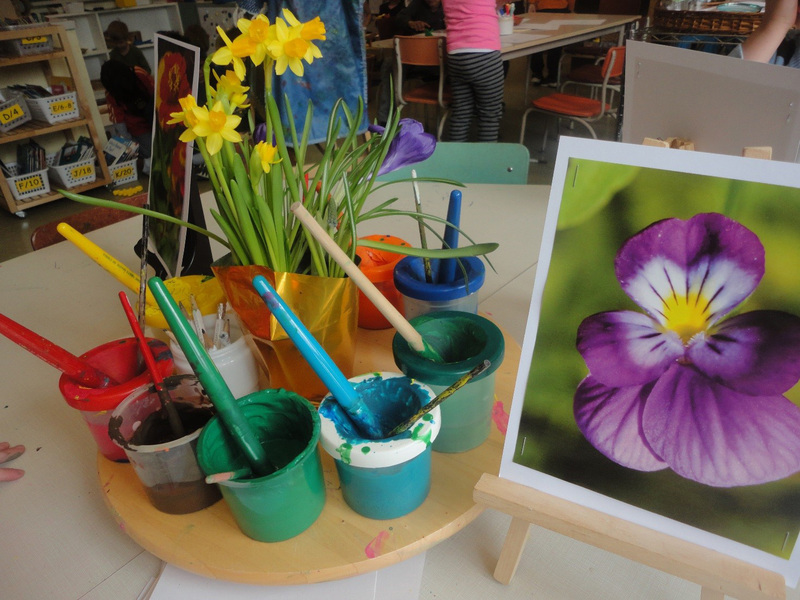 Our flower painting provocation at the art studio. 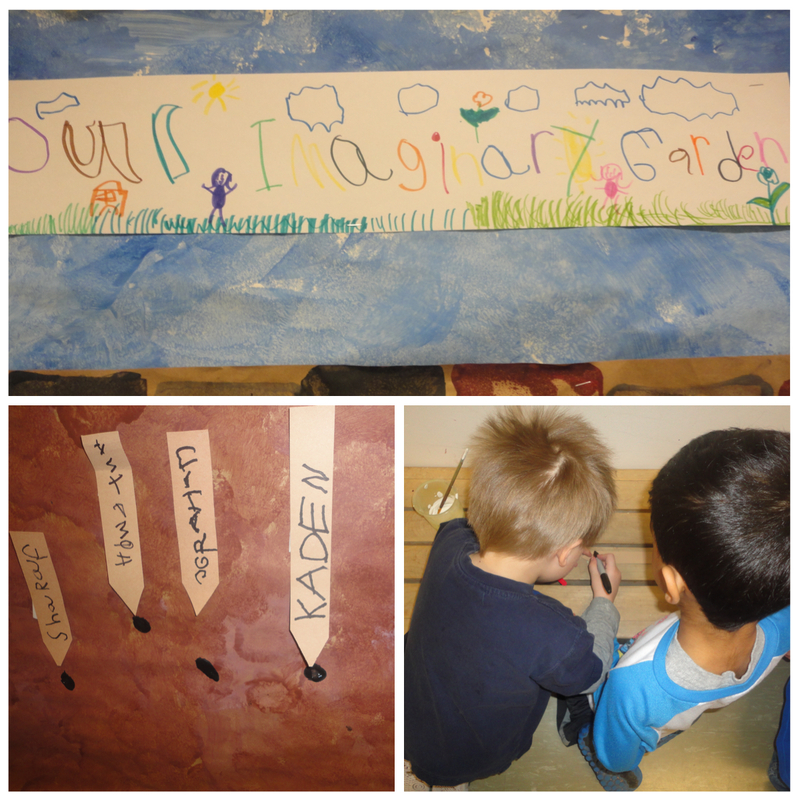 This entry was posted in Art Studio, Outdoor Classroom, Provocations, Science and Technology, Writing in Kindergarten and tagged Andrew Larson, Collaborative Art Piece, garden inquiry, garden mural, garden provocation, kindergarten mural, read aloud kindergarten, science and nature activities, seed inquiry, spring inquiry, The Imaginary Garden, Writing in Kindergarten by msmcdonell. Bookmark the permalink. Your ideas are so user friendly and integrate the arts seamlessly into the curriculum. 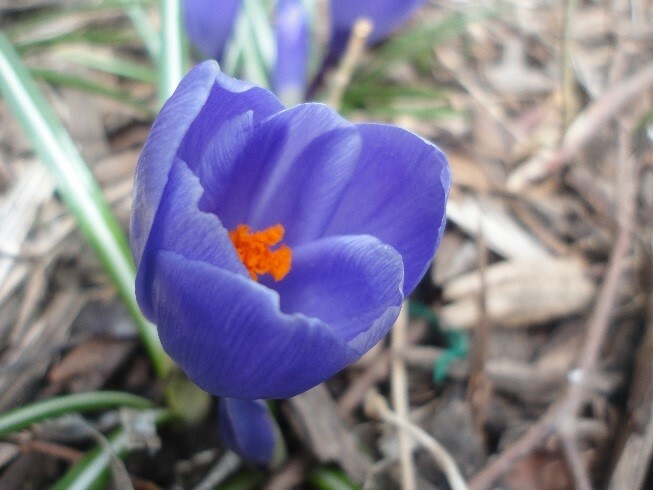 This idea is great this time of year when we are excitedly awaiting signs of spring. Each student got to create a piece of the larger whole that was then displayed for them to appreciate. The story I am not familiar with but will look for it to incorporate this theme. I love that you leave things for the students to do on their own time for example adding to the mural. 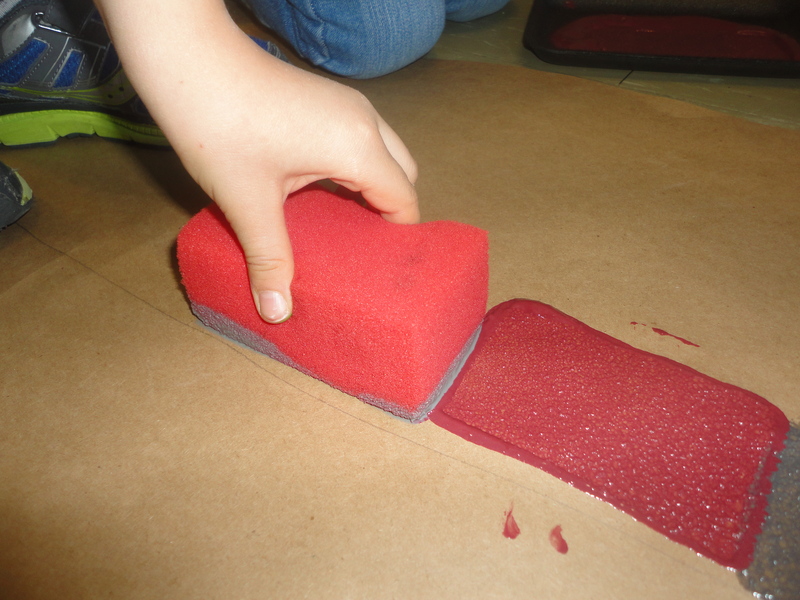 From planning, patterning, and labeling this lesson includes science, math, reading, writing, and the arts. Thank you for sharing! Keep it coming! Hi Nina! Thank you for the comment! I’m glad you found something to inspire you! This is SO beautiful! Love the idea of process-art that changes as the children grow and learn. Amazing teaching! Hi Stephanie! Thanks so much for the comment! Most of my favourite teaching moments have been arts related in some way. I love the way my students really “go for it.” Art experiences are so wonderful for encouraging confidence and risk taking!